Flooring installation projects for your home. It is always nice to make your home more beautiful through a flooring installation project. You may be thinking about doing it yourself after watching a home improvement show. You may have said wow I can probably do that myself and save some money. For many of the projects, especially carpet installation, they make it seem much easier than it really is. If you do not have the proper equipment you will have to buy it, which reduces the savings right away. Unless you are a handy person already you will need to spend time watching videos and learning how to stretch the carpet properly so it looks good for the long run. 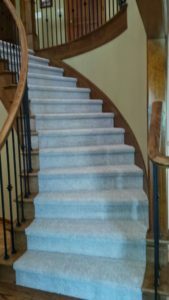 Trust me, it is not easy as I have spent a lot of time working on my house and properly installing carpet is not something you will learn quickly. When it comes to flooring installation having a professional contractor who does this every day will save you time and probably money in the long run. You do not want to invest a bunch of time only to have your work look subpar and the carpet not properly installed. Flooring is a substantial investment. Having the job done right will increase your property value, and that is what we all want. How complicated is the project to do yourself? For example, let’s say you tear up the old carpeting and find out the sub floor has issues that you are not prepared to handle. How much time is this going to take. Unless you are a handy person already you probably want to double the time you think it will take. You will have to go to the store several times to get what you need and to purchase the materials, just to get started. Ripping out the old flooring will create debris that you need to dispose of. Then you need to make sure everything is level and smooth if you are installing tile or hardwoods. A professional will be able to knock out the job very fast compared to the time it will take you and remember your rooms will not be useable until you finish the work. Do you have the proper tools and supplies? You will need to purchase a tile saw, carpet kicker, tackers, spacers, miter saw, seam cutter, etc to complete the project. The cost for this equipment will add up quickly and then what do you do with it when you are finished. You will need to store it somewhere and if you want to sell it you will most likely get only half of what you paid for it plus you have to go through the trouble to sell it. The other issue is learning how to use all of these tools correctly. There is always a learning curve and you may damage some of your tiles or carpeting while learning how to use the tools correctly. When you decide on your next flooring installation project remember proper installation is critical to creating a great looking room. Hiring a flooring contractor can save you time, stress and even money in the long run. At Coventry Carpets and Flooring we build upon your dreams and provide you the best looking rooms for your home. We will come out to your house with our mobile showroom or you can come into our showroom, with an appointment, to get ideas for your flooring installation project. Coventry Carpets guarantees their installation and takes pride in their work. Our design consultants have extensive knowledge and can help guide you through the different types of flooring options and the pros and cons of them in specific rooms in your home. We are one of very few flooring companies in Denver that actually do their own installations for carpeting and luxury vinyl tile. In fact. most other retailers sub out their work and you may never see that installer again. Most of our installation crews have over 30 years of carpet experience. For all other flooring projects we can provide the flooring and give you recommendations on contractors that we trust. Fall is a perfect time to remodel your home and carpet can be a great flooring option to give your home a fresh clean look. Why not spruce your home up for the winter as you will be spending more time there. Carpet adds value, style, and a warm feel to your home. 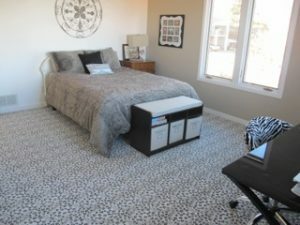 Carpet is available with soil, stain, odor, and static-resistant features, and manufacturing techniques have increased its durability and cleanability. Indoor air quality is more important than ever. The EPA reports that we spend approximately 90% of our time indoors. Carpet improves indoor air quality by trapping dust and allergens in the carpet, which are removed through vacuuming. Certifications like Green Label Plus certify that brand of carpet is a low emitter of volatile organic compounds. Easy Cleaning: Carpet is easier to clean than most other types of flooring. Carpet mainly needs regular vacuuming and perhaps an annual deep spring cleaning. That’s all it takes to keep your carpet looking great and lasting for its intended life. Style Options: Carpet offers many options to create the look you’ve always wanted. Lighter color options allow you make an area appear more open, while darker colors give an area room more coziness. You can choose a style of carpet that relates to comfort as well. Noise Reduction: Stereos, TVs, phones, kids, pets and computers can make all kinds of noise. Carpeting is very effective in absorbing these sounds. Carpet padding beneath your carpet reduces the sounds even more. Carpet provides a barrier between floors by helping to block sound to the rooms below. Coventry Carpets guarantees their carpet installation and takes pride in their work.